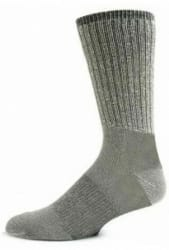 As one of its daily deals, 13 Deals offers two pairs of Mountain Lodge Men's Genuine Merino Wool Socks in Assorted Colors for $5.49 with free shipping. That's a buck under our mention from three weeks ago and is $3 less than the best price we could find for a similar pair elsewhere. They're made in the USA and available in men's sizes 10 to 13. Deal ends today.